Talladega, Ala. (October 24, 2015) - Making his first-career start at Talladega (Ala.) Superspeedway, Cameron Hayley, driver of the No. 13 Mattei Toyota Tundra, was hoping a little luck and his past superspeedway experience racing at Daytona (Fla.) International Speedway in the NASCAR Camping World Truck Series (NCWTS) season opener, would net a successful track debut for Saturday's fred's 250. Hayley, who welcomed new partner, Mattei, on board the No. 13 machine this weekend, did just that. Starting 16th, the Sunoco Rookie of the Year contender finished sixth, his 10th top-10 finish of the 2015 NCWTS season. The ThorSport Racing driver gained one position in the 2015 NCWTS driver point standings. Hayley is currently sixth, 20 points behind fifth-place, Timothy Peters and 120 markers behind leader, Erik Jones. 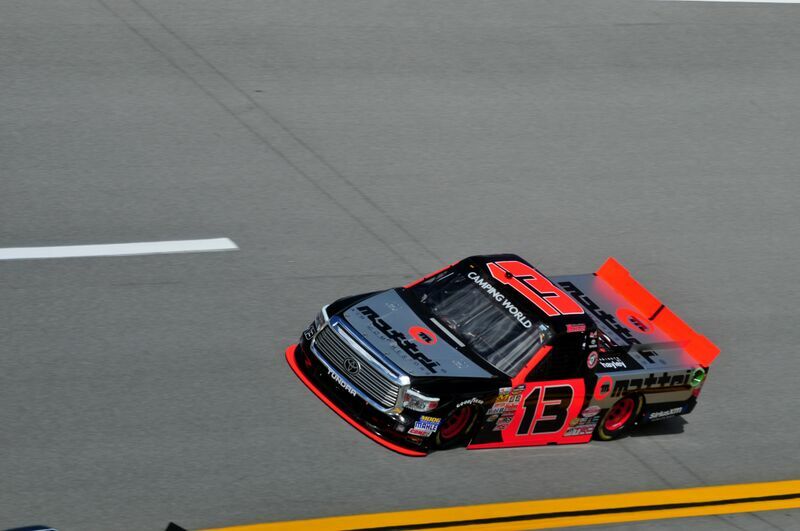 Timothy Peters won the fred's 250 at Talladega Superspeedway, followed by Brandon Jones (second), Mason Mingus (third), Erik Jones (fourth) and Tyler Reddick (fifth). Sandusky, Ohio (October 20, 2015) - Leaving Las Vegas (Nev.) Motor Speedway with his ninth top-10 finish of the 2015 NASCAR Camping World Truck Series (NCWTS) season, Sunoco Rookie of the Year contender, Cameron Hayley is currently seventh in the driver point standings entering the 19th race of the season at Talladega (Ala.) Superspeedway. Hayley, who is welcoming new partner, Mattei, onboard the No. 13 Toyota Tundra this weekend, will be making his second career superspeedway start, and his first on Talladega's high-banked, high-speed oval for the 94-lap fred's 250 powered by Coca-Cola on Saturday. Mattei Compressors, Inc., the leading provider of rotary vane air compressors, will be making their third start with ThorSport Racing, and their first of two appearances of the season with Hayley this weekend. The No. 13 Tundra will also sport the Mattei brand in the season finale at Homestead-Miami (Fla.) Speedway later this season. Competing on Daytona (Fla.) International Speedway's high banks in the 2015 NCWTS season opener, the 19-year-old Canadian driver got his first taste of high-intensity pack-racing. Qualifying 14th, Hayley was caught up in a multi-truck wreck on lap 48 of 100, ending his day early in the 23rd position. With 18 races under his belt, which includes 77 laps led, three top-five and nine top-10 finishes, since making his first start for ThorSport Racing at Daytona, Hayley hopes luck will meet preparation and experience, and the rookie driver can produce a solid finish following the 10th annual NCWTS at the 2.66-mile superspeedway on Saturday. "It's my first trip to Talladega Superspeedway. Daytona, early this season, didn't end too well for me. Another person's mistake turned into a bad day for me. Hopefully this time we'll have a good, clean day, and come out of there with a decent finish. It's a wild card race, so whatever I can take - a top-10 or even a top-five finish - I'll take it. After the Daytona race, I learned how quickly things can happen. It's a little bit nerve-racking and a little bit intimidating for a driver. You just don't know what's going to happen. We're going to do everything we can, and hopefully we'll be in front of everything this time around." Chassis Chatter... The No. 13 ThorSport Racing team will utilize chassis No. 24 for Saturday's fred's 250 at Talladega Superspeedway. This particular chassis was last seen at Daytona earlier this season. Hayley qualified 14th, got caught up in a multi-truck wreck before the races half-way mark and finished 23rd. Since February, the No. 13 team has completely rebuilt chassis No. 24 for Saturday's event. Welcome Aboard... The 19-year-old rookie welcomes Mattei onboard his No. 13 Toyota Tundra for this weekend's race at Talladega Superspeedway. Mattei has over 50 years of experience providing customers in every industry and market with superior compressed air products. Today, Mattei proudly serves a multitude of industries including agriculture, automotive and body shop, dry cleaning, energy, food and beverage, manufacturing, medical and dental, natural gas, pharmaceutical, plastics, woodworking and others. They understand industrial challenges and the solutions needed to overcome them. To learn more about Mattei compressors and how they can benefit your specific applications, visit www.matteicomp.com. Talladega Stats... Hayley will make his 15th NCWTS track debut of 2015 at Talladega Superspeedway on Saturday. Before 2015, Hayley had experience on three NCWTS tracks on the 2015 schedule; Canadian Tire Motorsports Park, Texas Motor Speedway and New Hampshire Motor Speedway. Season Review... After 18 races this season, Hayley has completed 2601 of 2726 laps attempted (95.4%) and led 77 laps en route to three top-five and nine top-10 finishes. The ThorSport Racing driver currently has a season-best start of third at Atlanta (Ga.) Motor Speedway, Martinsville (Va.) Speedway, and New Hampshire Motor Speedway in Loudon, and a season-best finish of fourth at Pocono (Pa.) Raceway. Rookie Race... Hayley is currently third in the 2015 Sunoco Rookie of the Year battle, 21 points behind second-place, Daniel Hemric. Both Sunoco Rookie of the Year contenders are chasing leader, Erik Jones. Previous Race Recap... Qualifying sixth in his debut at Las Vegas Motor Speedway, Hayley got off to a quick start in the Rhino Linings 350, remaining in contention with the leaders for the entirety of the 146-lap event, including leading the field for 23 laps. However, with fuel mileage becoming a factor as the laps wound down, Hayley ran out of fuel with two laps to go, relinquishing him to a 10th-place finish. Las Vegas, NV (October 4, 2015) - Making his NASCAR Camping World Truck (NCWTS) debut at Las Vegas Motor Speedway (LVMS), Cameron Hayley, driver of the No. 13 Monte Carlo/Carolina Nut Co. Toyota Tundra, got off to a fast start. The Sunoco Rookie of the Year contender was eighth in the lone NCWTS practice session on Saturday morning, and qualified sixth for his LVMS debut Saturday night. Hayley went on to lead the 32-truck field for 23 laps and brought home his ninth top-10 finish of the 2015 season, finishing 10th in Saturday night's Rhino Linings 350. When the green flag dropped for the 146-lap event, it was clear that the 19-year-old driver had quite a bit of speed under the hood of his No. 13 Tundra. Under the first caution of the night, on lap 15, crew chief Jeff Hensley made the call to bring Hayley down pit road for a fuel-only stop, gaining the Sunoco Rookie of the contender valuable track position when he restarted the race from the second position at lap 25. Shortly there after, on lap 38, the yellow flag was displayed again for fluid on the backstretch. Hayley visited pit road for four tires and fuel, and due to a mix of pit strategies, Hayley would restart 14th when the field took the green at lap 41. However, the Canada native didn't waste any time making up ground, picking up multiple positions on the restart. Racing his way back to the lead on lap 69, Hayley held command of the field for 23 laps, for just the fifth time in his young career. Relinquishing the lead to come down pit road on lap 92 for a scheduled green-flag pit stop, Hayley would slide threw his pit box, costing him valuable time on the track as the crew had to push him back before completing his pit stop. When green-flag pit stops finally cycled through, the ThorSport Racing driver found himself running third, chasing down the leaders once again. As the laps winded down in the 19th annual event, the No. 13 machine continued to gain ground on the leaders. However, a caution-free race in the last 94 laps, brought fuel mileage into play for the 32-truck field as the race neared the scheduled distance. Unfortunately, the Sunoco Rookie of the Year contender came up two laps short, and was forced to pit for a splash of gas at lap 144. Hayley would cross the finish line in the 10th position, one lap down to race winner, John Wes Townley. This solid effort marked the ThorSport Racing driver's ninth top-10 finish in his 2015 Sunoco Rookie of the Year campaign. "We had a great Toyota Tundra all night. It was awesome to have Monte Carlo on the truck and I think we represented them well on the track tonight. We ran among the leaders the entire race, led some laps, and had a really fast Tundra. I'm not a fan of fuel mileage races but it's apart of the sport. This is the second fuel mileage race we've lost and hopefully our luck can turn around for the rest of the season." Cameron Hayley qualified sixth and finished 10th in his at Las Vegas Motor Speedway debut in Saturday night's Rhino Linings 350. The ThorSport Racing driver led the field once for 23 laps in the 146-lap event. Hayley has now led 77 laps in 2015, a career-best. The No. 13 Monte Carlo/Carolina Nut Co. Toyota Tundra qualified sixth for the Rhino Linings 350. The ThorSport Racing driver is currently seventh in the 2015 NCWTS driver point standings just 11 points back from sixth. John Wes Townley won the Rhino Linings 350 at Las Vegas Motor Speedway, followed by Timothy Peters (second), Ben Kennedy (third), John Hunter Nemechek (fourth) and Brandon Jones (fifth). ThorSport Racing teammate Matt Crafton was eighth and Johnny Sauter was 12th. Loudon, NH (September 26, 2015) - Making his second-career start at New Hampshire Motor Speedway (NHMS) in Loudon, Cameron Hayley looked to build upon his previous top-10 finish in 2014 during today's 500th NASCAR Camping World Truck Series (NCWTS) race. Hayley, who is currently third in the 2015 Sunoco Rookie of The Year standings, piloted his No. 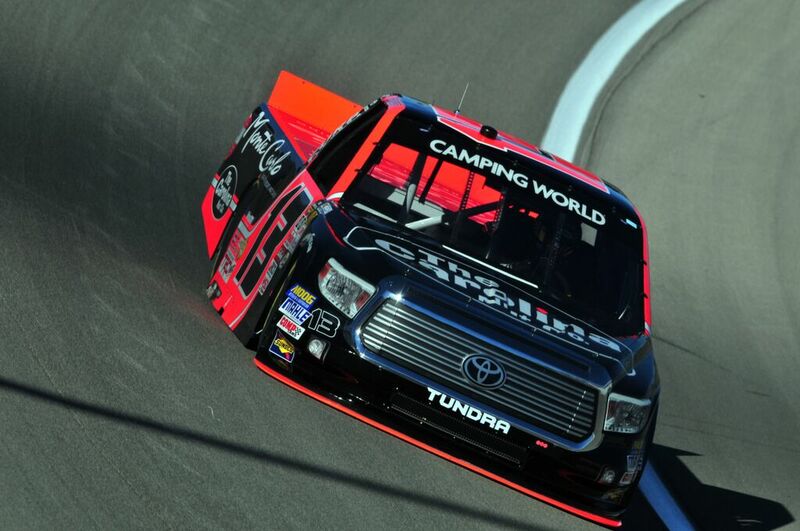 13 Cabinets by Hayley Toyota Tundra to a 12th-place finish. The ThorSport Racing driver is currently seventh in the 2015 NCWTS driver point standings, just 3 points back from sixth-place. Austin Dillion won the UNOH 175 at New Hampshire Motor Speedway followed by ThorSport Racing teammates Matt Crafton (second) and Johnny Sauter (third), Timothy Peters (fourth) and John Hunter Nemeck (fifth). Sandusky, Ohio (September 22, 2015) - Sunoco Rookie of the Year contender, Cameron Hayley, is looking to rebound this weekend following a 16th-place finish in the series last stop at Chicagoland Speedway in Joliet, and the "Magic Mile" is just the place to do so in his No. 13 Cabinets by Hayley Toyota Tundra. Hayley, who will be making his second start at the 1.058-mile track in the NASCAR Camping World Truck Series (NCWTS), scored a career-best, second-place starting position, in just his second career NCWTS race in 2014, and a solid top-10 finish, finishing sixth. 2015 Chassis Chatter... The No. 13 ThorSport Racing team will utilize chassis No. 36 for Saturday afternoon's UNOH 175 at New Hampshire Motor Speedway. This particular chassis was last seen earlier in 2015 at Iowa Speedway in Newton, where Hayley started fifth, and finished 19th after leading 37 laps. Loudon Stats... Hayley will make his second NCWTS start at New Hampshire Motor Speedway on Saturday. In his debut in 2014, Hayley qualified on the outside of the front row, and raced to a sixth-place finish. In fact, the ThorSport Racing driver ranks second in Average Start (2.0), fifth in Average Running Position (6.27), and fifth in Average Finish (6.0). Season Review... After 16 races this season, Hayley has completed 2281 of 2405 laps attempted (94.8%), and led 54 laps en route to three top-five and eight top-10 finishes. Rookie Race... Hayley is currently third in the 2015 Sunoco Rookie of the Year battle, only seven points behind second-place Daniel Hemric. Both Sunoco Rookie of the Year contenders are chasing leader, Erik Jones, after 16 races this season. Previous Race Recap... Despite rain washing out qualifying and pushing the American Ethanol 225 at Chicagoland Speedway in Joliet to Saturday morning, Hayley looked strong from the drop of the green flag. Hayley started seventh, and maintained a position inside the top-10 for a majority of the 150-lap event. However, a late race call from crew chief, Jeff Hensley to make it to the end of the race on one tank of fuel, derailed Hayley's day when he came up just two laps short on gas, relinquishing him to a 16th-place finish, four laps down.